In acknowledgment of the recent passing of Gardner Dozois, today’s Story Time is “Laying the Stones,” the very first story Gardner ever bought from me (and my second ever pro sale), breaking a long and very burdensome drought on my part. 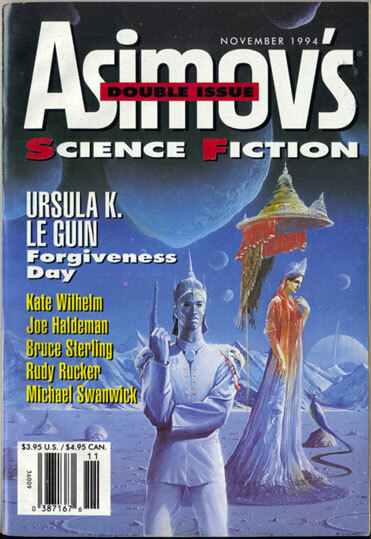 It appeared in the November, 1994 issue of Asimov’s SF and, as you can see, in very good company. This entry was posted in magazines, Process, Publishing, Reading, real life, Writing and tagged Asimov's SF, Gardner Dozois, Story Time by ogresan. Bookmark the permalink. Do you realise I probably have this issue of the mag packed up in my shed (from when we moved) J my shelf in the house starts at 1998…time flies. Ant. I probably have it too, though after a couple of moves I have no idea which box it’s in.